The momofuku team, led by chef/owner David Chang, swung through town during our week on microbes. David Chang and Peter Meehan produce the literary magazine Lucky Peach. Dan Felder and Veronica Trevizo are chefs who work in the momofuku kitchen lab. For LA Weekly’s rundown of the public lecture, see here. For more photos, see here. Microbial fermentation is one of the oldest cooking techniques in the world. 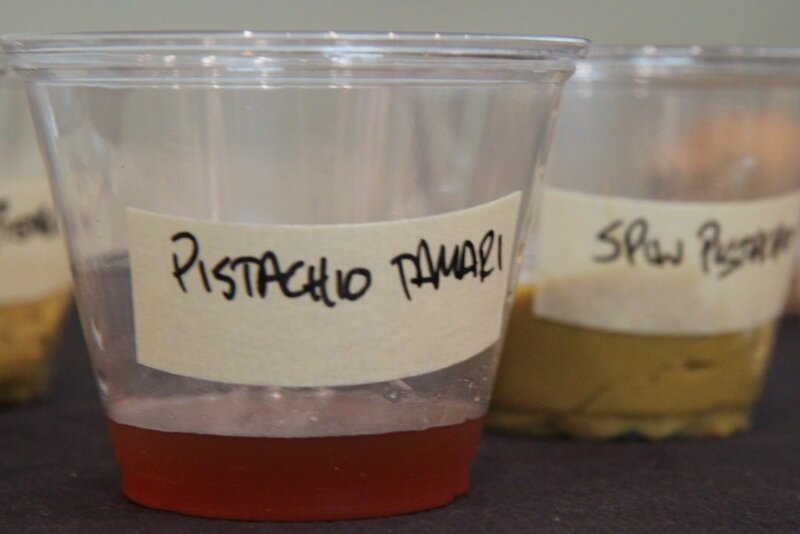 In the past two years, the momofuku team has been working to understand fermentation and apply it in innovative ways. When the team visited, we first tasted pistachio miso and MSG. Miso is traditionally made by inoculating soybeans or barley with Aspergillus oryzae, or koji in Japanese. 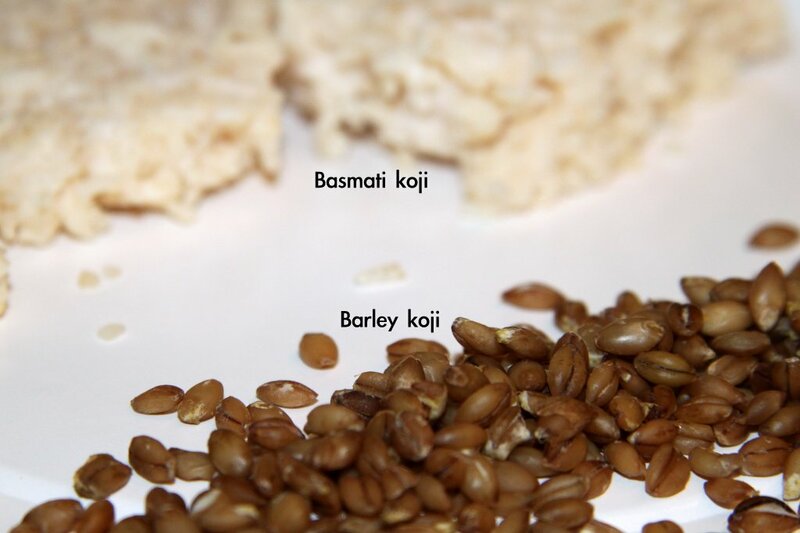 Koji is a mold that is also used in making sake and soy sauce. The momofuku team took this idea a step further, experimenting with inoculating untraditional ingredients with A. oryzae. 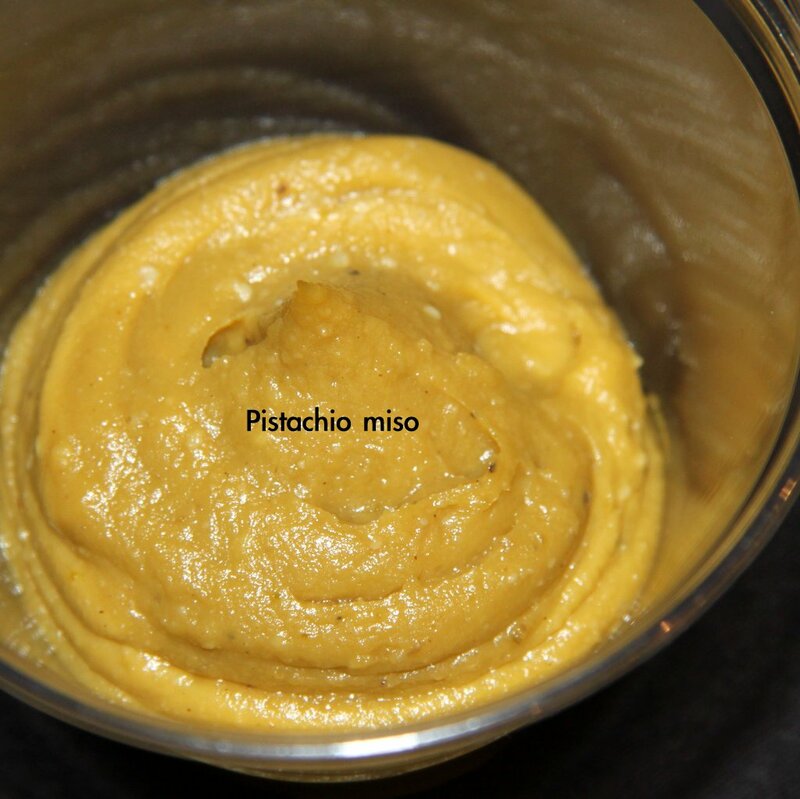 The resultant pistachio miso is a mildly salty paste with a subtle note of the nut. It tastes like dou fu ru, a fermented bean curd from China, of which, incidentally, some varieties are also made with A. oryzae. The momofuku team took this pistachio miso another step further, by centrifuging it. The miso separated into 4 layers, one of which is the “pistachio tamari” pictured below. We also sampled cherry and rhubarb vinegars from the lab. In making these fermentation products themselves, the momofuku chefs are putting an American spin on foreign products. Yes, they are Japanese in tradition, but they are made with a unique microbial community that is found nowhere else in the world except at 10th St and First Avenue in NYC. A deeper knowledge of science is valuable not only for understanding how each step of fermentation modifies the flavor and texture of the ingredients, it is also vital for safety. For a couple of years now, the chefs have been working with our friends Rachel Dutton and Ben Wolfe at Harvard who identify the microbes on momofuku samples and let the team know whether it is safe to eat them. Felder, Dan, et al. “Defining microbial terroir: The use of native fungi for the study of traditional fermentative processes.” International Journal of Gastronomy and Food Science. 1.1 (2012): 64-69. Speaking of letting things rot, see here to learn more about artist Heike Leis’ photographs of food rotting way beyond edibility. 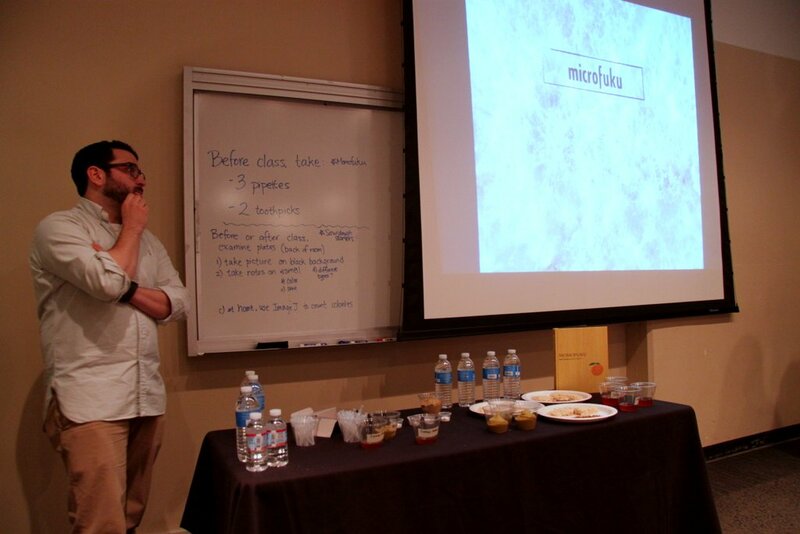 Tags: fermentation, microbes, momofuku. Bookmark the permalink. Previous post ← Does your cheese taste of microbes?